The band, Unified Past has been around for a fair bit of time, since 1999 in fact, although they existed as an earlier band in 1990, called Labyrinth, including two members who are still part of the band today, although only one has had continuous service. 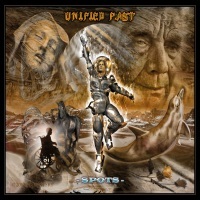 Spots is the sixth release from the band following From The Splintered Present Surfaces (1999), Power of Existence (2008), Breaking Up The Atmosphere (2009), Tense (2010) and Observations (2011). Spots was originally released back in 2013 and has been revamped ahead of the expected 7th album later this year. The band members for the recording of the album, Spots, were Steve Speelman (bass, keyboards, guitars and vocals), Victor Tassone (drums, percussion, effects and backing vocals) and Dave Mickelson (bass). I hadn’t heard of either Steve or Dave before but had come across Victor as a guest on the self-titled debut album by Corvus Stone. Unified Past certainly show that they have been influenced by Rush and Dream Theater, and seem to have their feet planted firmly in the melodic rock area, albeit with a bit of leaning toward prog metal. Spots is an 11 track album with a total playing time of around 59 minutes. The majority of the 11 tracks have single word names with the only exceptions being the last 2 tracks. The penultimate track is only a single letter, “G” and the final track is called just that, “The Final.” These 2 tracks are also the shortest, with “G” clocking in at 1:21 minutes and, the longest, with “The Final” running on for in excess of 8 minutes (8:27). Although Steve and Victor are listed as vocalist and backing vocalist respectively, 6 of the 11 tracks on offer are instrumentals. The opening track on Spots, “Blank” (5:17) has a short atmospheric build up, only around 18 seconds before the power trio of guitar, drums and bass announce their entry in a fairly forceful way. Seconds later, the vocals appear, and a minute after that the guitar throws in a great little riff which surfaces again later. This opening track is one which moves swiftly along, almost with the feeling that the music is being “kept in check” and not allowed to go careening off in any direction. The song benefits from this restraint being imposed. “Deep” (5:42) is a slower paced track which still allows some excellent guitar work over the rock solid rhythm engine that is the bass and drums, which underpins the track. “Hot” (4:44) takes a step into the jazz zone with some excellent driving passages and superb guitar themes. “Seeing” (3:49), “Tough” (8:18) and Age (6:26) move away from the jazz area back to the “classic power trio” playing of the earlier tracks. This then leads on to a series of tracks that are instrumentals, “Sun” (3:48), Big (6:35), “Wet” (5:07) and “G” (1:21). “Sun” is a short punchy track that drives along, “Big” is a slower tempo and goes through a number of time changes, “Wet” continues the slightly slower style and “G” is a quirky, very short piece, which in reality makes me question the inclusion of the track, as it is just so removed from where the other tracks are at. The final track, “The Final” (8:26) is another slow burner of a starter, with greater emphasis than before on the atmospherics, created by the majestic keyboards and the superb touch of Steve on the guitar. “The Final” is an excellent relaxed, laid-back track which finishes the album on a very positive note. Spots is an album that just doesn’t reach out, grab your ears and shout “this is great music!” It is an album that I think I will dip into from time to time and pick a few tracks to listen to. As always, my personal opinion may not be the same as anyone else, so give Spots a few listens and see what you make of it.